A module for Python that expose the OpenGL API and provides keyboard, mouse, sound, images handling. Great for doing some multimedia experiments or applications. A Julia fractal. Note the smooth, anti-aliased rendering. The color is picked as function of the estimated function to the Julia boundary. Pyglet is a very good Python module, wrapping OpenGL and providing access to mouse and keyboards events. The API is really easy to learn, well-documented, with that "clean & lean" feel to it. I started to use Pyglet for work, and I positively love it. So, Pyglet, allows you to summon the power of your graphic card using Python. And those days, even a puny low-end graphic card packs a lot of power : GPU, massively parallel computing. Although it's been around for years now, I never bothered tinkering with GPU, lack of time, other interests. Now that I feel comfortable with OpenGL, Python and Pyglet, however, harnessing this GPU goodness require very little effort. With years of delay, let's jump in that band-wagon already ! For a first try, I went for the done, done again, and overdone : fractals. More precisely, Julia fractals. You can see this fractal as function to iterate for each pixel of a picture, that takes as input the coordinate of the pixel. is a complex variable, with being the coordinate of the pixel in the complex plane, and a complex constant. This function is iterated until or a maximum count of iterations is reached. You then color the pixel depending on the number of iterations spent. 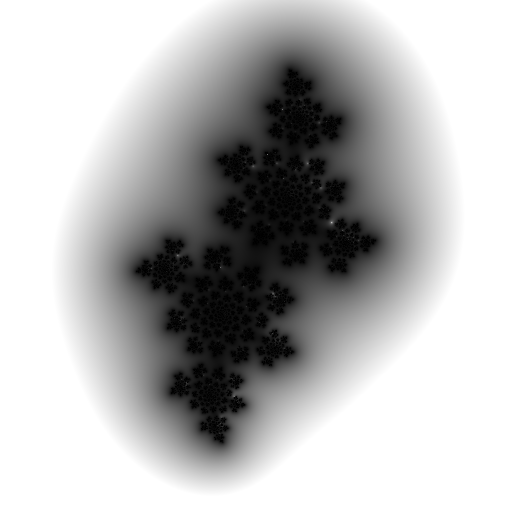 Consider visiting the Wikipedia page about Julia fractals, there is a lot to learn about it there. This code create a window, and display a quad polygon that fills the window. The texture for the quad is a procedural one, computed by a shader. Here, I use a neat utility class that encapsulate OpenGL API for the shaders : shader.py, by Tristam MacDonald. The parameter of the fractal is controlled by the mouse position in the window. Of course, most of the magic happens inside the shaders. The vertex shader, julia.v.glsl, is not exactly rocket science. All the actual job is done in the fragment shader, julia.f.glsl. Basically, I count how much iterations are required to have , and use this to pick a color. can be controlled from outside the shader, as uniforn variable. For sake of simplicity, I hard-coded the color scheme. One nice improvement would be to pick the color from a 1D texture, itself procedurally generated. Note that here I use a variant on the classical Julia : I render a distance to the boundary of the fractal, the trick being from the amazing Inigo Quilez. It gives me anti-aliasing at a much cheaper cost than super-sampling. A few minutes of coding, and I got that instant enlightenment, with a feeling of achievement on the top of it. Those GPU are indeed great little pieces of silicon !